The Muskegon Police Department provides law enforcement and policing functions for a 26 square mile area, including a variety of restaurants, retail stores, theaters, schools, industries and residential neighborhoods. In addition to district road patrol and non-uniformed detectives, the Muskegon Police Department also has neighborhood officers assigned to each of the fifteen neighborhood association areas within the City of Muskegon. These officers work in a unified effort with residents to address the most pressing concerns of their individual neighborhoods. They provide crime prevention training for residents and students and also participate in a number of community events designed to increase positive interaction between the police and the community. The Muskegon Police Department also works with residents on quality of life issues and may bring in or refer issues to other agencies as needed. Emergency dispatching is handled through a county-wide central police/fire dispatch system. Our mission is to reduce the perception and incidence of crime and enhance the quality of life for the citizens and guests of the City of Muskegon, through community partnerships and professional police services, while holding ourselves to the highest degree of accountability and ethical behavior. Demonstrate compassion for all people and render services with respect, dignity and courtesy. Promote a pro-active community policing philosophy by encouraging and supporting citizen involvement. communication and participation in decision making. Crime Activity Team Sergeant, Neighborhood Police Sergeant, Neighborhood Officers, Crime Activity Team and School Resource Officer. Director of Public Safety, Administrative Secretary, Administrative Captain (Training Officer, Internal Affairs Detective) Police-Community Coordinator. 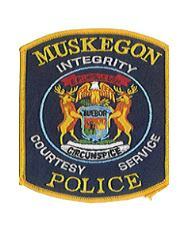 Current job postings from the City of Muskegon are located at our Civil Service Department. If you have any questions about a career in law enforcement with the Muskegon Police Department, please feel free to contact us at (231) 724-6751. For tips or questions only. This form is for occurrences within the boundaries of the City of Muskegon only and not any of the local municipalities or outlying areas. Official police reports cannot be filed online. If you need to file a police report you must contact 911 for emergencies or crimes in progress or you can contact the main police department desk to make reports of crime activity after the fact. * It may take up to 48 hours for you to receive a response to questions or tips! DIAL 911 to receive help now.